AleaSoft, August 30, 2018. The Spanish and Portuguese electricity market MIBEL is registering the highest prices of this year 2018. According to AleaSoft, the main causes are the escalation of gas and coal prices and the unstoppable uptrend of CO2 emission rights. 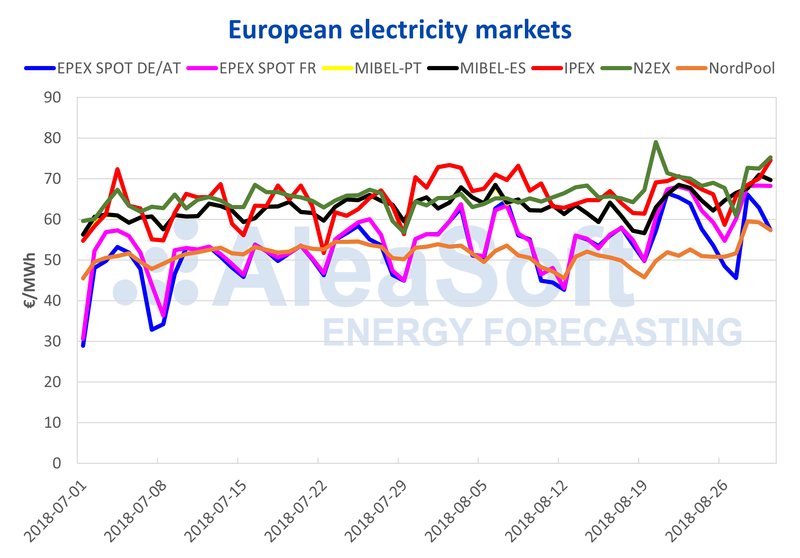 The price of the Spanish and Portuguese electricity market MIBEL has been breaking the record of highest price of this year 2018 in several occasions during this month of August. While waiting for the price for the last day of the month, the nine most expensive days of the year have been days of the month of August. And of the thirty most expensive days of the year, more than half are from the month of August. Meanwhile, the electricity futures of the Spanish market in OMIP for Q4‑18, have already exceeded 73 €/MWh, values that were unthinkable of just over three months ago when they were around 56 €/MWh. The futures for Cal-19, meanwhile, has exceeded 61.50 €/MWh, which at the beginning of May were around 51 €/MWh. Among the main causes of this price escalation that seems to have no ceiling are those that AleaSoft has already been explaining in recent news. On the one hand, the increase of the price of fuels. The European gas futures, after a very flat behavior since May, started an upward race this August that already accumulates an increase of 18%, and settled yesterday, August 29, at 25.87 €/MWh. European coal futures for September once again surpassed the $100 per ton barrier this week, after exceeding it briefly for a few days in July. And, on the other hand, the CO2 emission rights that have been rising steadily during the last twelve months with an accumulated rise of 247%, and in this last week registered a new leap: from 18.48 €/t on Monday, August 20, to 21.05 €/t yesterday, August 29, a jump of 14% in just one week. 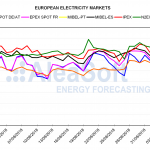 The situation of the nuclear power in France does not help either, with a large part of its nuclear power plants stopped, it is increasing the price of its electricity market, and it is dragging the rest of connected European markets. 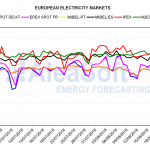 According to AleaSoft, this situation, together with the situation of fuels and CO2 price already explained, favored that, in the last two weeks, since August 20, the prices of the main electricity markets in Europe have increased and have been seen around 70 €/MWh, the price of traditionally more expensive markets. The exception was the NordPool Nordic market, which, although prices were much more expensive than the previous summer, remained around 50 €/MWh, until Tuesday, August 28 when it jumped to nearly 60 €/MWh.